We can hear the familiar voice before we can see the familiar face. "Shift it when you get it!" Mick McCarthy is back at work, bawling out instructions on a training field and for a fleeting moment it all seems a bit like 1996 again. For the second coming feels eerily familiar to the first; in terms of mood, at least. The retirement of an ageing predecessor who had lost his ability to inspire. An FAI who had begun what would develop into a perennial relationship with gloriously colourful controversy. A familiar worry about where the next generation of players would come from. And whether, even if they may have been more English rather than Irish, would they still love us anyway and put on the green jersey. Irish football needs something to smile about right now. Following the extended departure of the anachronistic Martin O'Neill and his goal-shy, ambition-deprived style that only inspired fear and loathing amongst those unfortunate enough to have been exposed to it - never mind those within his own squad - drastic change was required. Drastic change was postponed in favour of dramatic change, however; with the more enlightening approach offered by Stephen Kenny kicked down the road in favour of something more comforting to Irish international football, namely nostalgia. Throw in a star ex-player on the coaching ticket - a Keane will do nicely - then spin the wheel one more time. Even if, in this particular ball game, you might end up exactly where you started from. 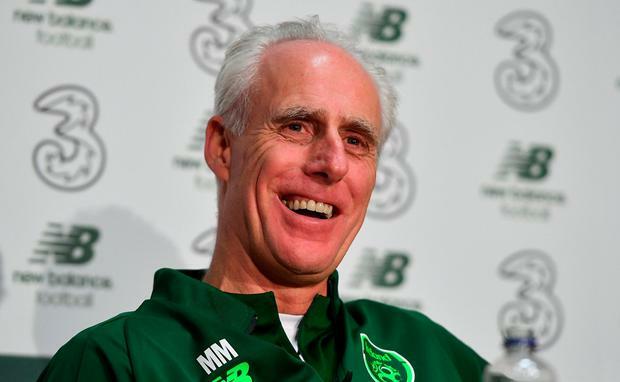 Depending on how much you care about Irish football and those responsible for curating it, Mick McCarthy is either the last thing the country needs right now or else he is exactly the right man at the right time. Whatever your perspective, the only thing that matters is that, by whatever means necessary, he does enough in the next campaign to ensure that when Irish football opens its doors to the rest of Europe in 2020, nobody views them with their trousers around their ankles. So, pressure much? Of course there is. Then again, McCarthy has always been one to absorb the pressure, rather than become inhibited by it. "There's real goodwill no doubt for me and Robbie and Terry Connor and for all of us. There seems to be a really good backing so that only adds pressure. But I've never been in a job where I've thought this is easy, it's a piece of cake this. "Like, the Millwall fans weren't bothered if they win or lose or the Sunderland fans or Wolves? They're not really bothered? Everybody wants success and I'd like to deliver a bit of that." McCarthy is not oblivious to the strained and straitened circumstances with which he commences his second tenure; after all, as we have outlined, they are pretty similar to those that confronted him 23 years ago when Jack Charlton's reign ended in ignominy. A knife-wielding exercise in a Dublin hotel had catapulted the FAI into a sequence of political cannibalism the lasting consequences of which still linger on to this very day as the organisation dominates the front, rather than the back pages. McCarthy is canny enough to dodge politics when asked how it felt to be back in a green tracksuit and bobble hat on a chilly Monday morning. He has always known that the best way to defuse a serious question is to humour the questioner. "Not in the hat, I don't think that it was very flattering. It's not a fashion show is it? Said all you of sartorial elegance. "I'm just delighted to be back working and then doing what is the best part of working in the football job which is being out on the training ground with the players. "I thoroughly enjoyed it this morning. It's been a long time, nearly 12 months - well, no, I was at Dagenham with Peter Taylor for a session in the summer but that was someone else's team. I enjoyed it just interacting with them all, watching them, being close to the action again, it's good." It's a pragmatic plea and one which has always served him best; so often in his career, either here or elsewhere, other complications have got in the way of him doing what he does best. There will be enough outside noise - much of it coming from within the FAI - over the next year but the man who can still make his verbal directions heard at 100 metres distance - against the breeze, mind - must ensure his voice is the only one that matters. There will be much focus on playing style but while McCarthy's superior Irish teams of yore were notable for their passing intent, his brief is to get points for victories, not artistic merit. "Well I think it is important to play well. But it's really important that we win. My remit surely with eight qualifying games is to win as many points as I can. "And nobody has ever complained when we're winning. So if we can play well and win it would be better. But I'll settle for winning." The winning personality, too, will help. They will need more than smiles this year, but rather that than the frowns of the last one.